Steve Bannon may have been shunned from one high-profile media confab, but he is still set to appear at another. A day after the New Yorker rescinded its invitation for Bannon to attend its annual festival, The Economist's editor-in-chief Zanny Minton Beddoes said her publication will still host the former White House strategist at its own event later this month. "The future of open societies will not be secured by like-minded people speaking to each other in an echo chamber, but by subjecting ideas and individuals from all sides to rigorous questioning and debate. This will expose bigotry and prejudice, just as it will reaffirm and refresh liberalism," Beddoes said in a statement published Tuesday. "That is the premise The Economist was founded on." Bannon will appear at The Economist's Open Future festival on September 15. His inclusion at The New Yorker Festival set off an uproar after it was revealed on Monday. A number of celebrities who were also slated to participate at the event, including Jim Carrey, Judd Apatow and Patton Oswalt, all backed out upon learning that Bannon was scheduled to be interviewed there by top New Yorker editor David Remnick. And staff members at the New Yorker also publicly objected. By Monday evening, Remnick informed staff that Bannon would no longer attend. The episode underscored a recurring dilemma in the news media world over whether Bannon -- whose stature has diminished after being exiled by President Trump and shunned by Breitbart, the right-wing website Bannon used to run -- warrants such prominent platforms. Margaret Sullivan, a media columnist at The Washington Post, wrote Tuesday that it is "utterly pointless" to offer Bannon such a "high-profile perch." 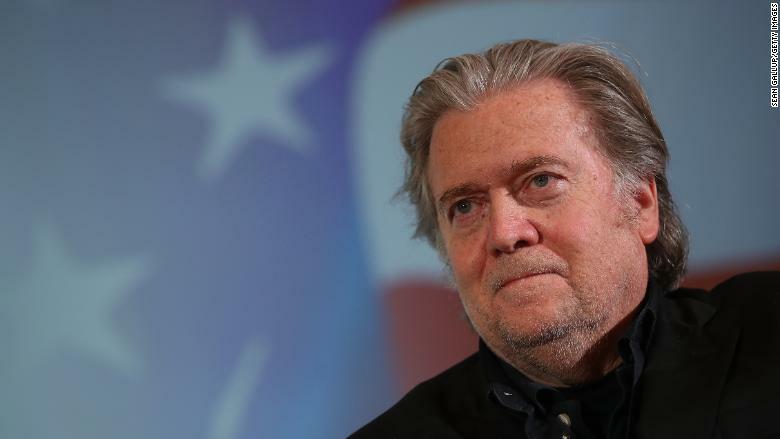 "There is nothing more to learn from Bannon about his particular brand of populism, with its blatant overlay of white supremacy," Sullivan wrote. Others, such as author and New Yorker staff writer Malcolm Gladwell, contended that the invitation to Bannon was appropriate. "Call me old-fashioned," Gladwell wrote on Twitter. "But I would have thought that the point of a festival of ideas was to expose the audience to ideas. If you only invite your friends over, it's called a dinner party." Bannon, for his part, said that the New Yorker had capitulated to a "howling online mob." Beddoes and The Economist, meanwhile, are standing firm. "When James Wilson launched this newspaper in 1843, he said its mission was to take part in 'a severe contest between intelligence, which presses forward, and an unworthy, timid ignorance obstructing our progress.' Those words have guided us for 175 years," Beddoes said. "They will guide our debates at the Open Future festival on September 15th. That is why our invitation to Mr Bannon will stand." Correction: A previous version of this story incorrectly identified Beddoes as a man.